Service Repair Manual Nissan Nissan Pulsar Sunny Sentra N14 B13 1990 1991 1992 1993 1994 1995 Workshop Manual pdf download. Nissan Pulsar Sunny Sentra N14 B13 1990-1995 Factory Service Manual is very detailed and contains step by step instructions and repair info. 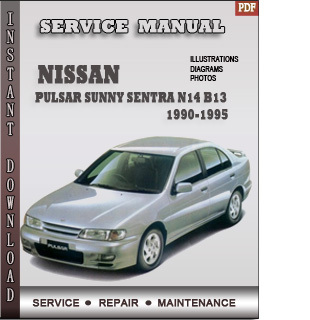 To download Nissan Pulsar Sunny Sentra N14 B13 1990-1995 Repair Manual click on the instant download button, pay with your paypal/credit card and you will receive link to download .